New York, Judson Gallery, Ray Gun Show, March 1960, n.n. (installation). New York, Reuben Gallery, The Street, May 1960, n.n. (installation). Washington, D.C., The National Gallery of Art; New York, The Solomon R. Guggenheim Museum; Los Angeles Museum of Contemporary Art; Bonn, Kunst- und Austellungshalle der Bundesrepublik Deutschland; and London, The Haywood Gallery, Claes Oldenburg: An Anthology, February 1995-August 1996, p. 57, no. 13 (illustrated in color). The Street exhibits the influence of Dubuffet and l'Art brut. Oldenburg once explained that "Jean Dubuffet influenced me to ask why art is made and what the art process consists of, instead of trying to conform to and extend a tradition." (quoted in ibid.). Yet while Dubuffet portrayed urban life through representation, Oldenburg's art centered on the appropriation of the materials and the silent, inherent language of the street. 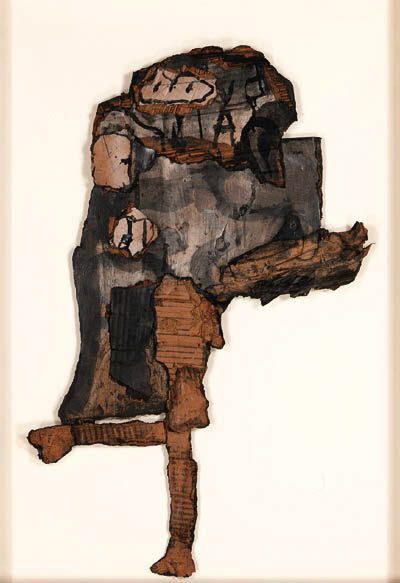 When the installation was removed from the galleries, the various cardboard pieces were essentially ripped from their environment, removed from the flow of The Street. The torn edges of the works render them like artifacts, refuse from the urban landscape. It is not accidental that the subject of the present fragment combines the organic and the inorganic -- a girl and a car -- with their forms dissolving inextricably into a single mass. New York, The Museum of Modern Art; Amsterdam, Stedelijk Museum; Dsseldorf, Stdtische Kunsthalle; and London, The Arts Council of Great Britain, Claes Oldenburg, September 1969-August 1970, no. 135.